Most of us have been through the horror of waiting for web pages on our mobile gadgets to load over painfully slow Internet connections. The experience is simply exasperating. It often adds up to wasted data use, since most people tend to hit the reload button to refresh the partially loaded pages. 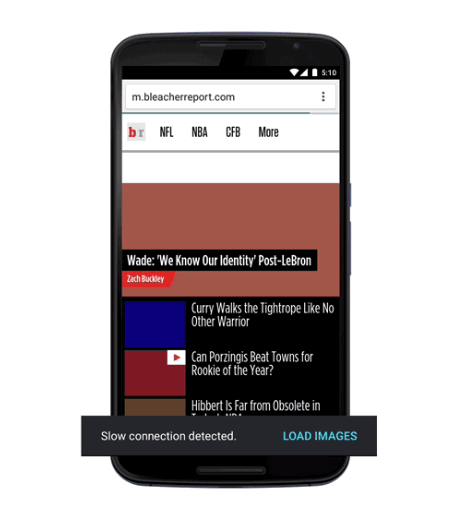 Now, Android users with Chrome installed on their mobile devices have reason to hope: Google has just rolled out a more aggressive Data Saver mode for Chrome that speeds up page loading and can help you avoid wasting megabytes of your data plan. It’s a welcome solution, especially for users with limited data plans. To activate Data Saver in Chrome, tap the Menu button (three dots icon), tap on “Data Saver,” and switch on the feature. When in use, Data Saver causes web pages to load without images when Chrome detects that your mobile has a slow connection to the Internet. In many cases, images take up the bulk of a web page's overall file size, but using page and image compression plus image blocking, you can save about 70 percent of data. If you really want to view particular images on a page, you can selectively choose which ones to download or fetch all web page images in one go. The relative increase in page loading speed becomes more noticeable when you’re on a really slow connection. The earlier version of Data Saver mode, which is available on Chrome for both iOS and Android, only cut down about 50 percent of webpage data, with compressed images made more compact using the WebP format. The images were downloaded in smaller file sizes and therefore required less bandwidth. In the new Data Saver mode, suppressing the images entirely saves about 20 percent more data, unless you expressly tell Chrome to display the images. There’s no word yet about whether the improved Data Saver mode will be hitting iOS devices, but it is safe to assume it will at some point. in the meantime, the earlier version of Data Saver is still available, so iOS users can avail themselves of 50 percent data use reduction when loading webpages in Chrome. A beta version of the Data Saver feature is also available as a browser extension for desktop Chrome.